The year 2018 marks the 10th anniversary of Gerald Arpino’s passing and the 30th anniversary of Robert Joffrey’s passing. The Foundation is honoring these two renowned innovators in American dance by having organizations nationally and internationally perform their works. Performances scheduled to happen during the 2018-2019 dance season will receive a very significant reduction in the licensing fee. We hope your organization will take this opportunity to be a part of this important celebration. Please consider honoring the legacies of these two men by licensing one of their many works from the Foundation. Paypal and The Gerald Arpino Foundation make it easy and convenient to support the works of these extraordinary men. By clicking on the ‘donate’ button, a Paypal window will open up and will allow you to give at your own convenience. Please show your support to The Gerald Arpino Foundation today! Paypal accepts all major credit cards. Gerald Arpino’s Light Rain will be performed simultaneously the weekend of Feb 16-17, 2019 with three different dance companies. St. Louis Ballet and Nevada Ballet Theatre will present the iconic pas de deux in their mixed repertory program. Butler Ballet/Butler University will present the ballet in its entirety utilizing a cast of fourteen dancers. Gerald Arpino created this ballet to showcase the new young dancers of the company. “It is my gift to these talented youngsters…I am inspired by their modes and rituals, their passions.” Middle Eastern rhythms fused together with an unusual combination of banjo, violin, mandolin, bass, drums and bamboo flute give Light Rain its distinctive mesmerizing and hypnotic sound. 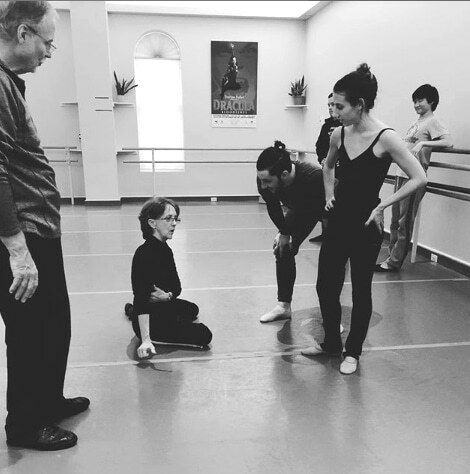 photo credit: Charthel Arthur Estner, repetiteur for the Gerald Arpino Foundation rehearses Dayton Ballet dancers as Dermot Burke, former Artistic Director/former Joffrey Ballet dancer looks on. Gerald Arpino’s Trinity makes its revival with Dayton Ballet’s Perspective program on Feb 14-17, 2019. Considered culturally ahead of its time, Trinity is a ballet choreographed by the late Gerald Arpino, co-founder and former artistic director of the Joffrey Ballet. While the Vietnam War was raging, America’s youth united in protests and celebrations with a new sense of freedom and exhilaration. The word “trinity” in this work represents three sentiments prevalent in the culture of the late ’60’s and early ’70’s: love, power, and peace. Trinity became the most famous of the Arpino pieces called the Berkeley ballets. Created during the Joffrey’s residence at the University of California at Berkeley, Trinity is a joyful tribute to youth, their passions and rituals.